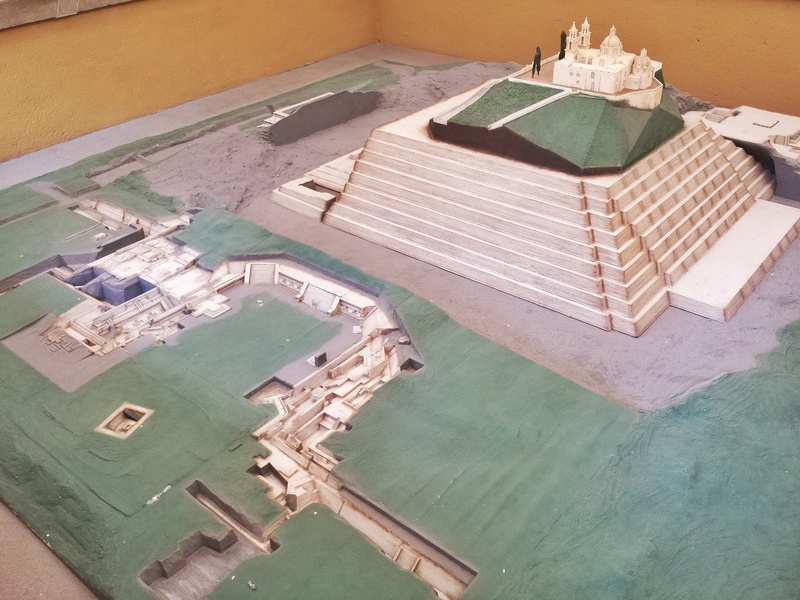 Model of the Great Pyramid of Cholula as it is visible today – EXCEPT that the pyramid is mostly uncovered, meanwhile in reality it looks like a green mountain. In the model, everything that is green was once also built up and may yet be dug up as the archeological dig is ongoing. 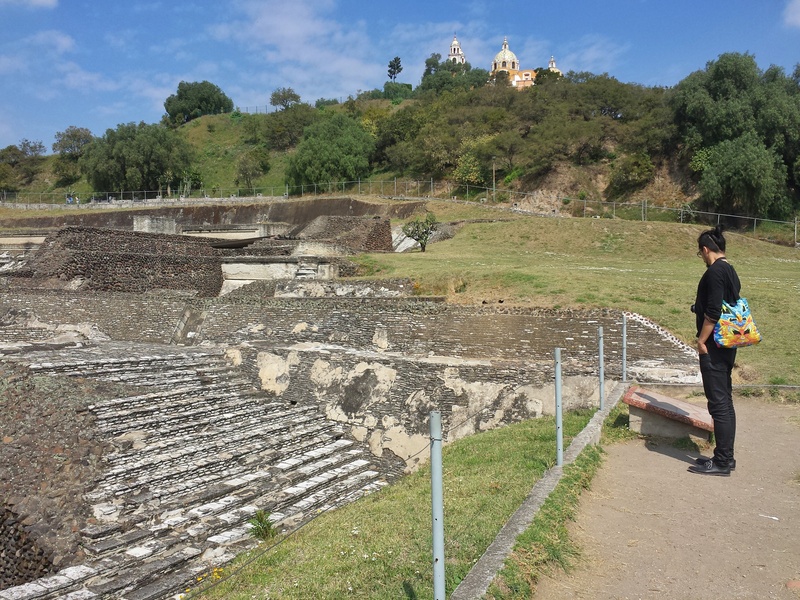 The ancient city of Cholula was extensive and sophisticated, with many towers of white stone dotted throughout the urban area and rich, well irrigated farmlands in the surrounding plains. The Spanish recorded their amazement at the structures and the richness of the culture… and then we know what happened next anyways. 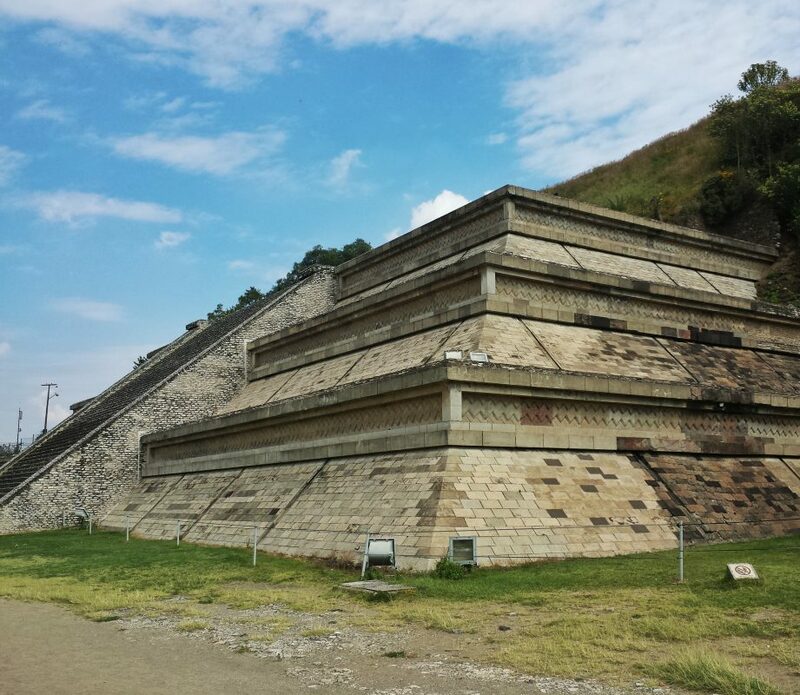 The Great Pyramid of Cholula, just outside the city of Puebla in Mexico, is that largest constructed pyramid in the world, with each side at the base measuring 400 meters and an overall height of 450 meters. Because the pyramid is covered in earth and vegetation, it feels like a mountain to be near it and it’s nearly impossible to imagine it as built by humans. Other archeological digs reveal further the extent of the built city. 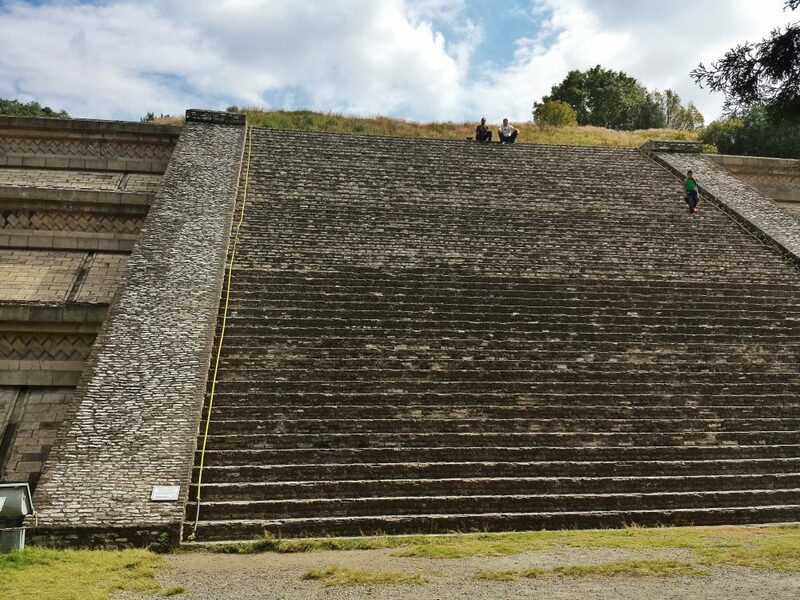 The pyramid was built in 4 stages between the 3rd century BC and the 9th century AD. In the first stage there was a flat pyramid of 5 levels, then 2 more levels were added, then the whole thing was covered in another greater pyramid, and then again until the “current” state of the Great Pyramid. 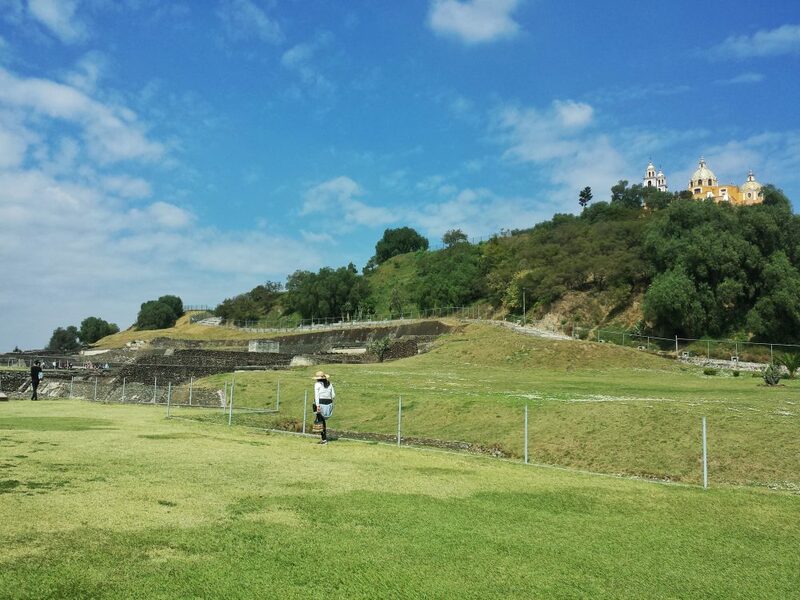 Walking around the base of the Great Pyramid of Cholula, Mexico. The pyramid is the whole “mountain” that starts at about where the fence and treeline are in the photo. An edge of the base of the built structure hidden beneath the earth is 400 meters long on each side. Marc in the altar area in front of the pyramid, and the Great Pyramid is that hill in the background, topped with a church. Why is it covered in earth and trees? Contrary to other sites where abandonment caused the structure to be overtaken by nature, the Great Pyramid at Cholula was covered up on purpose before the Spanish arrived. 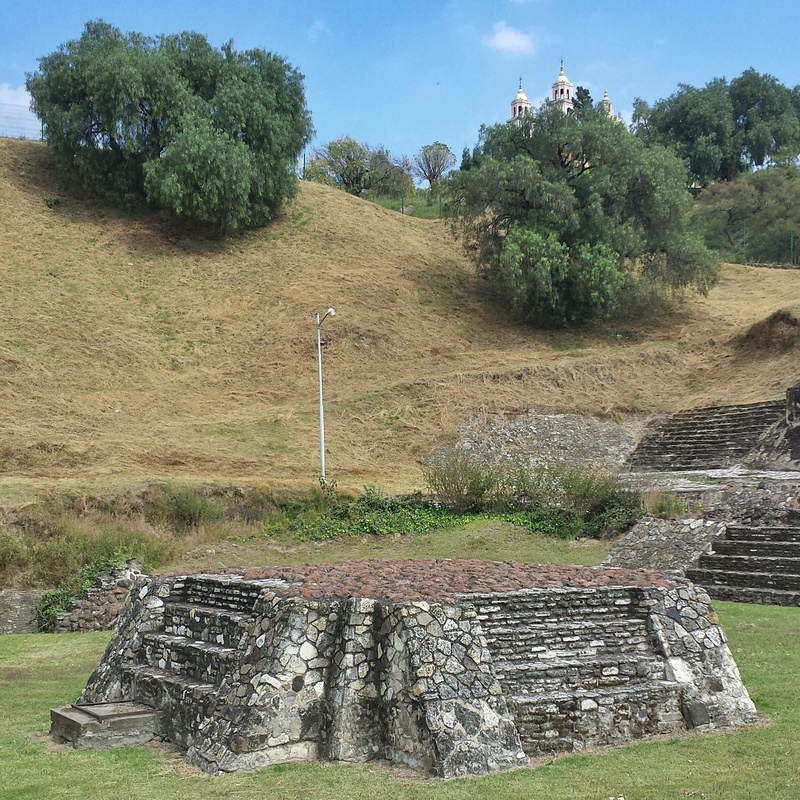 Legend tells that a man in Cholula had a dream that foretold of the coming of the invaders, and the pyramid was completely covered in earth in order to hide and protect it. A small temple was built on top, apparently as a decoy. When the Spanish arrived, they destroyed this small temple and erected a large cross, never suspecting that the mountain they were standing on was in fact a pyramid. 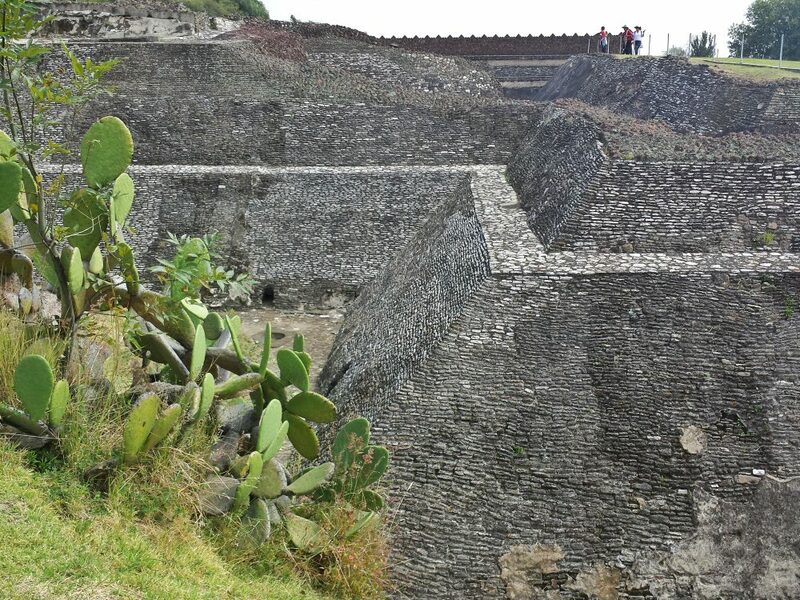 Cactus and walls in the ancient city of Cholula. 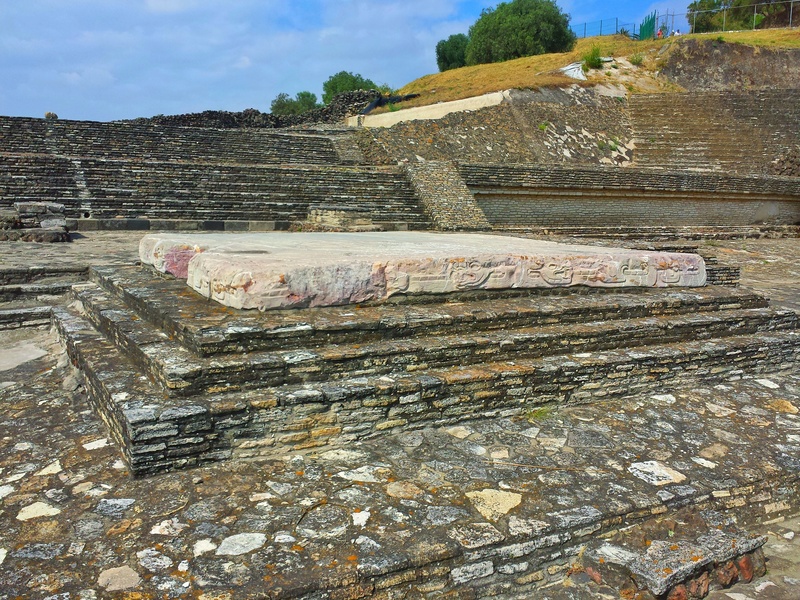 A pink granite slab with a carved border on just one side of the grand altar breaks the symmetry of the front part of the Great Pyramid stairways and patios. Interestingly, the cross erected by the Spanish was fairly promptly destroyed by lightning. Another cross was erected and this one, too, was destroyed by lightning. Finally this was replaced with a larger structure, which was later replaced by the church that stands on top of the pyramid today. To the side, ruins of the child sacrifice altar. Straight up, children between the ages of 5 and 7, apparently. Restored corner of one of the small “patios” in the altar areas to the side of the Great Pyramid. This portion in the model above is in the left top of the photo. Marc and Michael, our host in Puebla, sitting on top of a grand stairway. 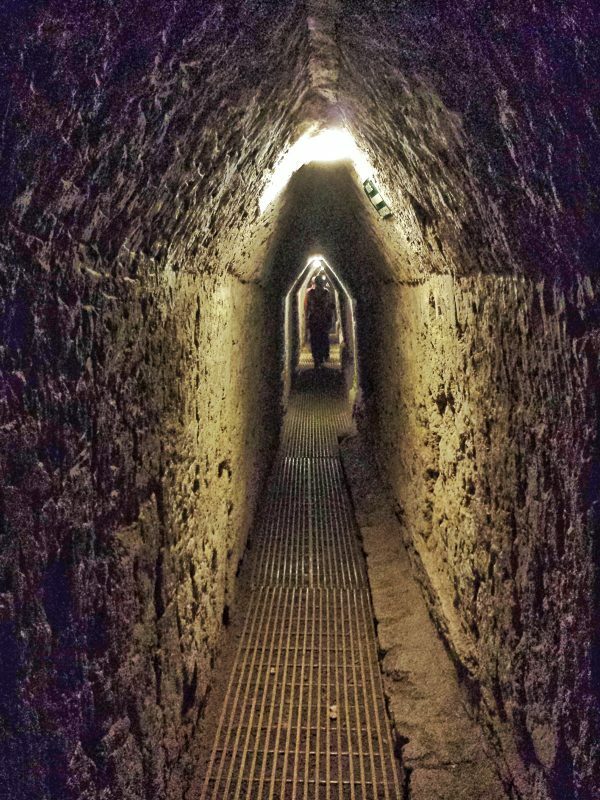 Tunnels inside the pyramid. The ceiling is very low, it smells of earth, and it is very, very quiet. 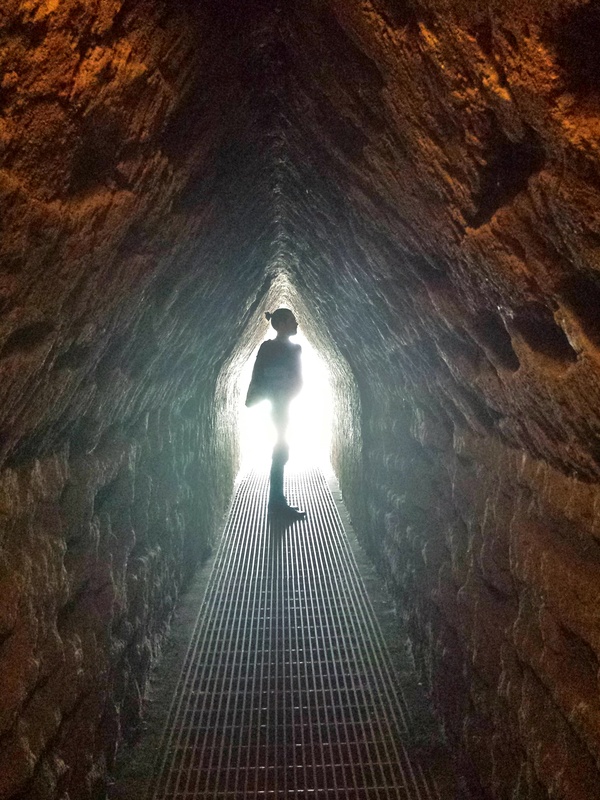 Marc at the exit of one of the tunnels in the Great Pyramid of Cholula.